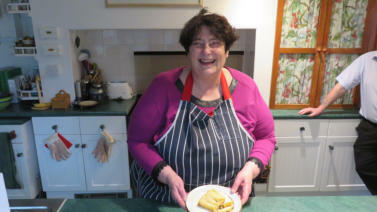 Changing How the World Thinks About Blindness with Baking Blind Who: I’m Penny Melville-Brown from Hampshire in the UK. It was a misery when blindness ended my career in the Royal Navy but, over the last 18 years, I’ve put my energy in to helping other people with disabilities to get back to work. I’ve just launched www.bakingblind.com to show that disability needn’t limit our ambitions or capabilities – and the Comic Relief episode reveals the fun side too! As a result, I was invited to enter the prestigious international Holman competition - spookily commemorating another blind Royal Navy officer (but from the early 19th century). My short video bid has taken me to the semi-finals (along with two others from the UK, the most from the USA and others from around the globe). What? My goal is to cook around the world – with professional chefs and home-cooks, sighted or not. Using social media, videos and blogs, I’ll showcase cooking as a universal language: sharing our passion for food while demonstrating that blindness needn’t hold me (or others) back. I have already developed a project outline with key outputs, steps and structure. Help please: the prize will fund very basic travel and accommodation for my videographer and me – but probably not internal flights/travel. So, now I’m looking for help: • Local people close to main airports who will help on the ground: cooking with me and finding 3 or 4 others who will do so too. Perhaps there is a restaurant or an airport catering facility, a hotel or café happy to take part? • Help with travel and accommodation: every extra flight, coach ticket or ferry and every extra night will mean that I can go further and reach more people to share my upbeat approach to life with disability. Throughout, I’ll be promoting the adventure to local media to spread this positive message and support. I’ll welcome public speaking opportunities and interviews while gathering enough material to achieve online coverage for at least 12 months – and possibly a book. Deadline. I have just four weeks to put together the detailed project plan and budget. If you could help, a commitment-in- principle by 25 April would be invaluable but, of course, would be nullified if I didn’t succeed in winning the prize. You probably have great ideas that would make the whole project more successful – please don’t hold back but tell me what I could do better.